UNC Charlotte athletic trainer Adam Jordan uses close relationships and clinical skill to keep players healthy. Campus is quiet and the sun is just beginning to glimmer across the windows of Halton Arena as Adam Jordan flicks on the lights of his basement office. 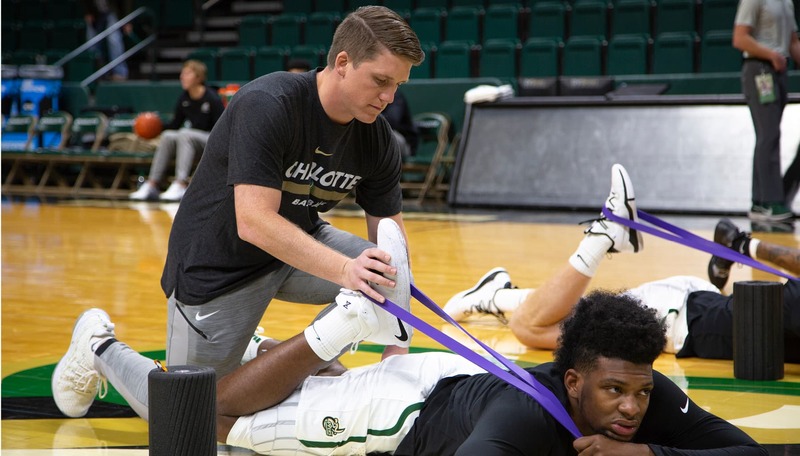 The head athletic trainer for the Charlotte 49ers men’s basketball team starts most days before 7 a.m. – documenting injuries and treatments, preparing medicines, and chatting with players as they trickle in for the early weightlifting session. Jordan makes his way around to each player as they warm up, asking about sore muscles or nagging injuries. Coffee in hand as always, he lingers to check in with star senior Jon Davis, who had been dealing with some muscle cramps. A few days from now, Davis will lead the team in scoring and hit a three-point buzzer beater, completing an improbable comeback to topple Oklahoma State. 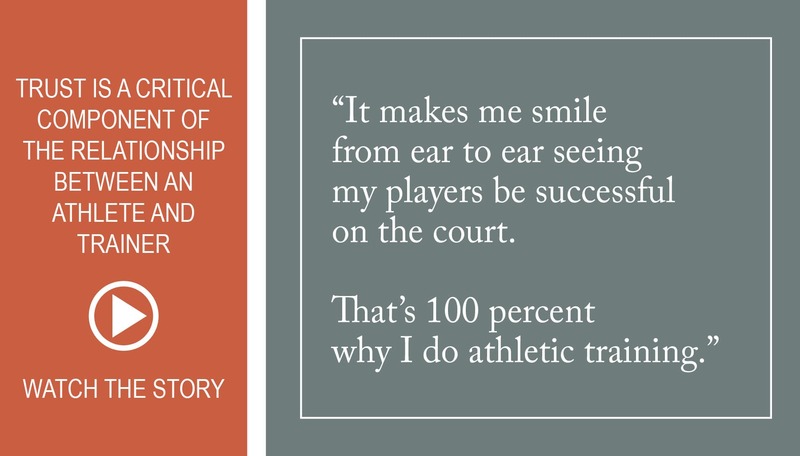 This player-trainer connection is a critical one for the success of the team. So much so that Jordan says his first priority as an athletic trainer is to develop a relationship with the athletes and coaching staff. An extension of the team physician, Jordan is tasked with keeping players healthy and on the court. He’s trained in a variety of clinical interventions, and uses a discerning eye and knowledge built through hours and hours of practice and game observations to prescribe the right treatment at the right time. “We do the nitty gritty. It boils down to prehab, rehab, treatment, pharmacology, psychosocial interventions. We have a close relationship with our physicians and we work together to take care of our athletes,” he said. He suggests his rapid ascent to a top position underscores the quality of UNC Charlotte’s program, one that continues to evolve to meet the demands of the industry and student needs. With that in mind, future athletic training graduates will follow a new path intended to prepare them with the instructional training and clinical skills needed in a field increasingly recognized as the advanced primary care profession that it is. The undergraduate athletic training program admitted its final group of students in fall 2016, and next summer UNC Charlotte will admit the first students to its Master of Science in Athletic Training. UNC Charlotte is among the first wave of programs shifting its degree offering in response to a consensus of athletic trainers nationwide and the profession’s accrediting bodies. “The degree shift is essential to ensuring our future ability to meet the expectations of the health care team, to continuing to improve patient outcomes, and to keeping our profession sustainable for generations to come,” said the Strategic Alliance in a statement describing the move. Similar rehabilitation and primary care professions such as physical therapy and physician assistant have recently transitioned their degrees to the master’s level or higher. While the master’s requirement led some athletic training programs to shift focus or fold, it was met with enthusiasm by leaders at UNC Charlotte. “We feel we have offered one of the best athletic training programs in the country so it was a no brainer to transition our undergraduate program to a master’s degree,” said Bret Wood, UNC Charlotte athletic training clinical coordinator. As part of the shift, the athletic training curriculum will expand to cover more primary care, emergent care, and diagnostic knowledge and skills. Clinicals will include more primary care and office-based experiences and students will receive more on the job training. Like Adam Jordan, many athletic training alumni have found early success in the field. UNC Charlotte trainers currently work for organizations such as the Seattle Seahawks, Pittsburgh Pirates and NASCAR. From early morning workouts to midnight texts about rolled ankles, staying connected to his players is a 24/7 job for Adam Jordan. It’s committed. It’s personal. So, when he saw Jon Davis rise up over the outstretched hands of two defenders and kiss the ball off the glass for the win?